Chinese Writing and the Scripts of Culture. New York: Columbia University Press, 2014. 296 pp. Andrea Bachner’s Beyond Sinology: Chinese Writing and the Scripts of Culture is the latest to appear in the Global Chinese Culture series from Columbia University Press. It takes its place alongside Sinophone Studies: A Critical Reader, edited by Shu-mei Shih et al., and other titles in Chinese literature, comparative literature, and film. 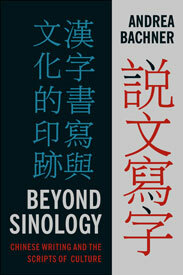 Bachner, though herself solidly grounded in comparative literature, has chosen in this book to extend her analytical gaze to the cultural significance of Chinese characters—or as she calls them, perhaps on the analogy of sinophone, “sinographs”—thereby plunging into the dangerous waters of graphology and semiotics, menaced by the looming icebergs of linguistics. The impulse for her move into new territory, as Bachner tells us, came from a conference on Globalizing Modern Chinese Culture held at Harvard University in late 2007, and attended by many of the big names in the burgeoning field of Sinophone Studies. These scholars, including Rey Chow, Eric Hayot, Haun Saussy, Shu-mei Shih, David Wang, and others, “welcomed” Bachner’s “claim that a reflection on Sinophone literature and culture needed its complementary other: a thought on the sinograph” (p. xi). Bachner lays out her “thought” by way of a number of intriguing case studies, among which we may note: the 文字 “Chinese Characters” segment from the opening ceremony of the Beijing Olympics in 2008; the “pedagogy of writing” in Zhang Yimou’s film 英雄 Hero; the inequalities of the multilingual economy of Taiwan as represented in Hou Hsiao-Hsien’s film 悲情城市 City of Sadness; the tension between the standard orthography and the dialectal “voicing” of Han Shaogong’s fictional 馬橋詞典 Dictionary of Maqiao; the creation, by the protagonist of Malaysian writer Kim-chew Ng’s short story 阿拉的旨意 “Allah’s Command,” forced to suppress his Chinese linguistic repertoire for most of his adult life, of a “crypto-Chinese” script that no one else can read; finishing up with the “ideographic architecture” of a Danish architectural firm for the REN-Building, which takes the shape of the Chinese character for “person,” 人ren. Chapter 2, “Iconographies,” analyzes and complicates the symbolic link between the sinograph and visuality, most (in)famously embodied in the pictographic bias that equates Chinese writing and imagistic mimesis…. [C]hapter 3, “Sonographies,” is concerned with the interaction between phone and graphe. Its first part reflects on the frequent silencing of the Chinese language in Western theory by isolating script from its real linguistic complexity…. Its second part provides a critique of the media politics in recent theory that equate the sonic with resistance and marginality…. Chapter 4, “Allographies,” investigates different examples from the margins of the Chinese tradition that render Chinese writing other to itself and therefore break the link between the sinograph and a monolithic imaginary of “Chineseness”…. The fifth chapter…, “Technographies,” addresses sinographic reactions to the challenges of the digital turn: the modular and combinatorial thrust in Chinese pseudographic art and poetry and the specter of the complete obsolescence and loss of writing connected to Chinese Internet language as well as expressed and encountered in experimental poetry. This broad theoretical sweep, in conjunction with the detailed case studies, should provide a valuable description of the cultural terrain of Chinese characters, and the new uses for which they are being deployed in an ever-changing media landscape. But sadly the main impression left by Bachner’s book, for this reader at least, is one of descriptive richness marred by theoretical incoherence. As Bachner herself acknowledges in her Introduction, “Script Politics,” the problem she has taken on encompasses a multitude of academic fields, including graphology, linguistics, intellectual history (Michael Friedrich, Christopher Bush, 汪暉 Wang Hui, 黃錦樹 Kim-Chew Ng), language reform (胡愈之 Hu Yuzhi, John DeFrancis, William C. Hanna, Jing Tsu), media studies (Kai-Wing Chow, Thomas Carter, Constance Miller, Lydia Liu), nationalism (Benedict Anderson), and others. The absence here of any references to specifically linguistic scholars should strike the enquiring reader as highly significant. A nuanced appreciation of the operation of Chinese characters as a writing system, and beyond that an understanding of the semiotics of speech and writing and the relations between the two, must surely lie at the base of a multidisciplinary project such as Bachner’s if it is to succeed in linking linguistic texts to a broader range of cultural phenomena. In this regard, it may be relevant to line up Bachner’s chosen term “sinograph”—one not (so far) widely used in Chinese Studies—against the “sinophone” which seems to have been its conceptual godparent. Since “sinophone” made its appearance on the academic scene in 2005, it has been defined and differentially employed by a number of scholars, including Shu-mei Shih, Geremie Barmé, Haun Saussy, Victor Mair, and, if modesty permits, myself. [ 1 ] Over the last decade, its allegiances to the older term “francophone” have been discussed, and the issue of whether it should include or exclude political as well as cultural China have been debated. In contrast, Bachner never defines “sinograph” at all: the best we get is a parenthetical indication in the index—“(Chinese characters/script)”—which of course may well come courtesy of the publisher rather than the author. As academic readers, we do not need a formal dictionary-style definition of “sinograph,” but we do need an understanding of how it differs from the ordinary term “Chinese characters,” and some sense of the other concepts with which it is in contrast: some sense, to use the Saussurean term, of its valeur. In the field of semiotics, arguably the best proponent and exponent of “negative capability” is Saussure, whose work demonstrates an unrivalled ability to circle round the complex topic of language as a system of signs and see it simultaneously from a number of equally relevant vantage points, like a master juggler keeping multiple balls in the air. [ 2 ] Unfortunately, it is the specter of Derrida, rather than the shade of this more helpful theorist, that hangs over Bachner’s study. Derrida’s attempt to rework the priorities of Western philosophy by way of a reanalysis of the relationship between spoken and written language[ 3 ] unfortunately employs “facts” not so much as struts in his theoretical construction of a workable conceptual framework for understanding the phenomena under examination, but rather as so many rhetorical counters to cast at his theoretical opponents. Such an approach seriously reduces the usability of such a framework in the text analysis that forms the descriptive basis of a study such as Bachner’s. We get a sense of the kind of problems with this approach from Bachner’s first chapter, “Corpographies.” Here Bachner seems to be following the same “method” as Derrida in his famous attack on Saussure in De la grammatologie: that is, to ignore the main “body” and context of issues raised by earlier critics or theorists in favor of focusing on slight “blemishes” that are magnified into huge “malformations.” Bachner likewise, in the first section of this chapter, “Death and the Sinograph,” makes great capital out of the claim that “[d]uring the era of language reform under the aegis of Westernization and the idea of nationalism, the Chinese language acquired a body, a dead one” with the “reincarnation of the sinograph as corpse and disease-carrier” (p. 20). One wonders, parenthetically, if Bachner is unaware of the active polysemy in Chinese of 活 huo “alive” and 死 si “dead” with “living, flexible” and “rigid, inflexible,” respectively, which surely has some relation to the language reformers’ choice of rhetoric here. Nonetheless, there is no doubt that in the first half of the twentieth century, among certain thinkers on the Left, the most famous being 魯迅 Lu Xun, the Chinese language itself was identified as one of the great obstacles to modernization, even as a threat to the body politic itself, as summed up in Lu Xun’s famous dictum 漢字不滅，中國必亡 “Unless Chinese characters are got rid of, the Chinese state is doomed.” However, to treat such rhetoric as somehow essentially pathological, without acknowledging the genuine problems of literacy, education, and under-development that existed at the time, is to ignore that there were good reasons why Chinese characters, particularly as identified with the traditional written language, 文言文 or Classical Chinese, came to be regarded as the very symbol of feudal culture standing in the way of modernization. The fact that an intellectual like Lu Xun, a master of the classical language, could nevertheless call for the abolition of the characters which were essential to its survival, shows some of the complexities and contradictions in which cultural change so easily becomes mired. In treating such complex issues, Bachner is prone to essentialize, transforming them, to draw on the same trope, from a living dialogue to a fixed “truth.” In the second half of this chapter, “National Calligraphies,” Bachner refers to an “imaginary of Chinese necroscripts,” a phenomenon to which she then finds a “spectacular counterpart” in “a new calligraphic identity politics” (p. 43) associated particularly with the Beijing Olympics of 2008. If Bachner’s theoretical stance allowed her to conceptualize the “dead” and the “living” as part of the same dialogic relationship, there would be no problem in acknowledging that the two may co-exist in a mutually defining discourse. Nor would there be any mystery in the phenomenon of certain characters being converted from “morbid metaphors of decaying scripts and festering bodies” into a “living dynamic script, a medium in motion” (p. 43), in Bachner’s typically overstated characterization. The Beijing Olympics logo, based on the character 京 jing, as in Beijing “Northern Capital” (not 文 wen as Bachner claims), is in origin a picture of a tower; but that is no barrier to it being reimagined as “an abstracted icon of a body in motion.” It is no doubt the fact that many Chinese characters do contain pictographic elements that suggested their use as such: as Bachner herself acknowledges, “typographic design loves to play with bodies and letters, both alphabetic and not” (p. 43). There is, it seems to me, a serious methodological and theoretical issue here for all scholars dealing with complex cultural and ideological phenomena such as these. The very reinventions and re-imaginings of Chinese characters that Bachner documents are of course well worth examining as part of the contemporary Chinese cultural landscape. But if as analysts we simply treat such phenomena as so much fodder for our own academic riddling, are we not thereby failing to do them justice as part of that broader landscape, not to mention doing a disservice to our readers by failing to give them an integrated understanding of it? The arguments put forward in the remaining chapters of Bachner’s book are likewise vitiated by this approach, and hence I do not attempt to discuss them in the detail normally expected in a review like this, since it would involve a similar process of trying to make sense of an account that seems almost designed not to be interpretable. In reading Bachner’s genuinely rich and intriguing case studies, I felt frustrated by a theoretical running commentary that seemed to keep on undercutting itself. In the academic opposite, as it were, of the advertising slogan “and there’s more!,” Bachner seems to be continually warning “but there’s less!”: undermining fixed certainty—as is absolutely appropriate in analysing semiotic phenomena—but without putting anything in its place. If this was juggling, then it felt like the balls were simply receding further and further into the distance. Saussure emphasized the necessity for a differential, negative understanding of semiotic phenomena, but at the same time understood that in use such signs took on positive value: otherwise how would meaning making be possible? Bachner seems unfortunately to have equated semiotic negativity with analytical indecisiveness, thus sadly reducing the utility and interest of her fascinating data. [ 1 ] Shu-mei Shih, Visuality and Identity: Sinophone Articulations across the Pacific (University of California Press, 2007); Geremie R. Barmé, “New Sinology,” Chinese Studies Association of Australia Newsletter 31 (May 2005). Haun Saussy, “On The Phone,” Printculture (posted Nov. 30, 2012); Victor Mair, “Sinophone and Sinosphere,” Language Log (2012); Edward McDonald, “The ‘中国通’ or the ‘Sinophone’? Towards a Political Economy of Chinese Language Teaching,” China Heritage Quarterly 25 (2011). [ 2 ] See the very helpful introduction, by Perry Meisel and Haun Saussy, to a new edition of Saussure’s Course in General Linguistics (New York: Columbia University Press, 2011). [ 3 ] Jacques Derrida, De la grammatologie (Paris: Les Éditions de Minuit, 1967).